From his days as a pastor in the mid-1950s until his death in 2015, Dr. James M. Dunn was a tireless advocate and activist for soul freedom: the freedom, ability, and responsibility of each individual to respond to God for herself or himself. During his ministry in Texas and Washington, D.C., Dunn established himself as the public heir of E. Y. Mullins and those before him who insisted that an unfettered conscience and uncoerced faith—born out of a direct personal experience of God and without reliance on ecclesiastical leaders—represented the authentic Baptist tradition. To countless Baptists, James Dunn was an instrumental influence. His wit, wisdom, and fight moved generations of Baptists to better live out our faith, value our freedom, and never take our shared heritage and liberty for granted. 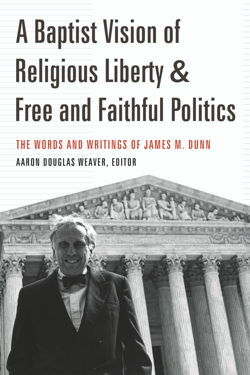 Aaron Weaver’s collection of the words and writings of James Dunn will help present and future generations of Baptists, as well as other people of faith, remember, learn from, and live out his vision of religious liberty and free and faithful politics. Aaron Douglas Weaver has served as communications director of the Cooperative Baptist Fellowship in Atlanta, Georgia, since 2013. He is the editor of fellowship! magazine and oversees media strategies and digital and print communications. He received his MA in church-state studies and PhD in religion and politics from Baylor University, where he focused on faith-based advocacy and religion and the First Amendment. Weaver and his wife, Alexis, have two children, Oliver and Miriam. They reside in Tucker, Georgia, where they are members of Smoke Rise Baptist Church. In this engaging volume, Aaron Weaver brings together the words, ideas, and energy of James Dunn, one of Baptist’s most outspoken (that’s an understatement) advocates of and authorities on religious liberty in the American Republic. Through this well-edited collection of his many sermons, speeches, and articles, Dunn’s prophetic voice lives on, and none too soon. The Baptist genealogy on religious liberty in America goes like this: Roger Williams, John Clarke, Isaac Backus, John Leland, J. M. Dawson, and James Dunn. No Baptist in my lifetime cared more deeply and barked more passionately at the intersection of religious liberty and the separation of church and state than James Dunn. Aaron Weaver puts us in his debt for this stockpile of Dunn’s words, a gift that will keep on giving to future generations. So important!